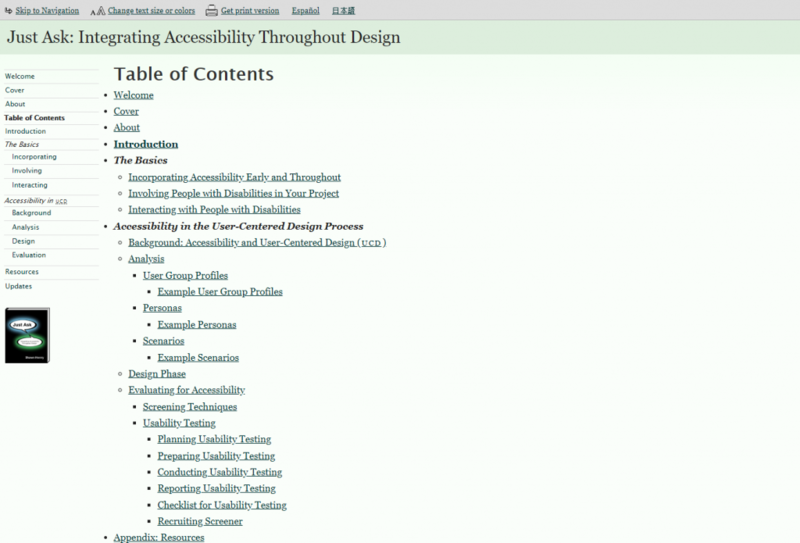 The accessibility of your design is an important factor to consider when building websites and software. This book is a great introduction to accessible design and user-centered design. How do you effectively communicate data with design? This book introduces you to the basic concepts behind data research, analysis, and visualization. Whether you’re designing infographics, web forms or admin dashboards, this is a superb read. 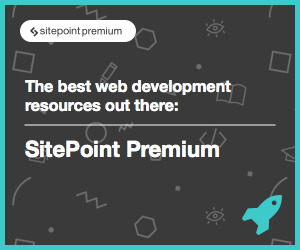 You’ll find an abundant amount of web design tips and strategies in this book. It talks about a wide range of subjects: getting your first design job, design research, typography, color, and more. Understanding Workflow: One Mockup or Many? The Tools: Just like a carpenter, a designer will have his favorite tools. Working for yourself: So you want to work for yourself? And why not. The Brief: The Brief, in its different forms, represents the start of a project. Research: Research is a profession in its own right. Ideas: They are the heart of every creative process. Putting it together: Case study for a gardening website. Anatomy: Typefaces, like most things, are made up of constituent parts. Classification: Typefaces have defining characteristics that give them personalities. Hierarchy: Typographic hierarchy, put simply, is how different faces structure a document. Typesetting: The font industry is big business, and rightly so. Printing the web: The screen is just one of the media types for which we have to design. The Colour Wheel: Colour theory involves a great deal of complex terminology. Hue, Saturation and Brightness: Describing colour can often be confusing. Colour Combinations and Mood: Colours chosen from different spokes on the Colour Wheel will provide a variety of colour combinations. Designing without Colour: Lowering the Tone. Colour and Brand: Can you imagine a classic coke can in any other colour? The Basics of Composition: For centuries there has been a link between art and mathematics. Spatial Relationships: Space is important in layout. Grid Systems: A grid is an instrument for ordering graphical elements of text and images. Breaking the Grid: Should Everything Always Line Up? Bringing it all together: Case study for De Standaard. What does it really feel like to be a designer in this industry today? 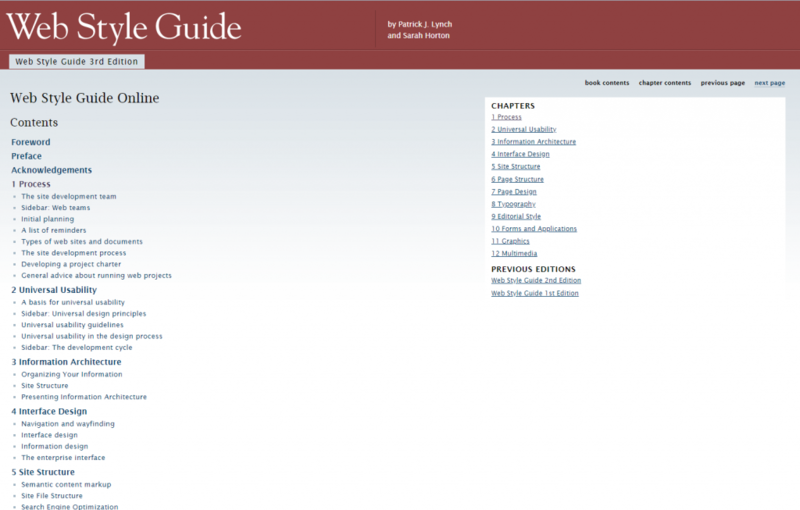 A fieldguide for makers. 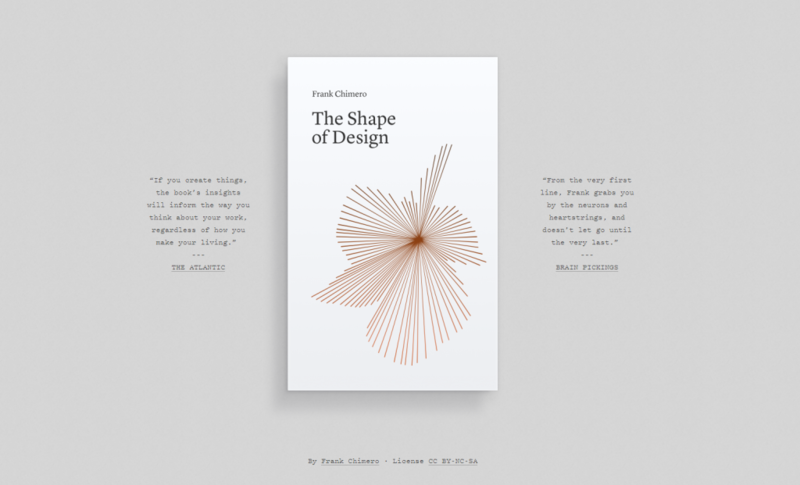 A love letter to design. If you create things, the book’s insights will inform the way you think about your work, regardless of how you make your living. 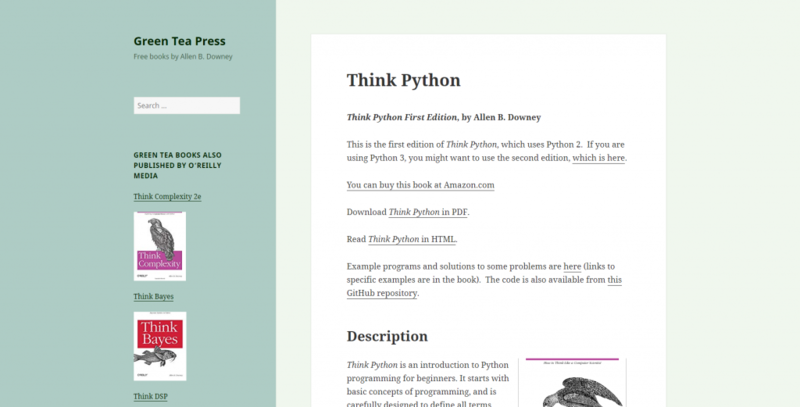 Text Processing in Python describes techniques for manipulation of text using the Python programming language. At the broadest level, text processing is simply taking textual information and doing something with it. This might be restructuring or reformatting it, extracting smaller bits of information from it, or performing calculations that depend on the text. Text processing is arguably what most programmers spend most of their time doing. Because Python is clear, expressive, and object-oriented it is a perfect language for doing text processing, even better than Perl. As the amount of data everywhere continues to increase, this is more and more of a challenge for programmers. This book is not a tutorial on Python. It has two other goals: helping the programmer get the job done pragmatically and efficiently; and giving the reader an understanding – both theoretically and conceptually – of why what works works and what doesn’t work doesn’t work. Mertz provides practical pointers and tips that emphasize efficient, flexible, and maintainable approaches to the text processing tasks that working programmers face daily. 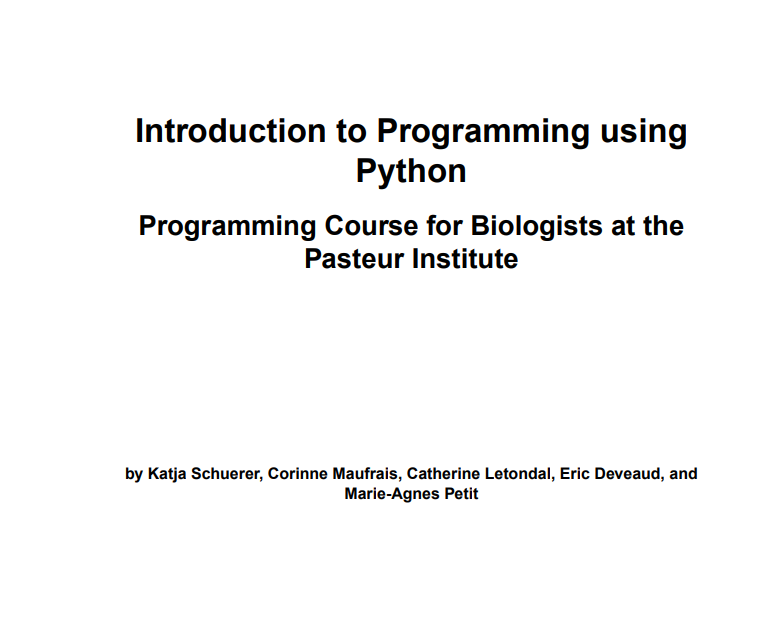 The objective of this course is to teach programming concepts to biologists. It is thus aimed at people who are not professional computer scientists, but who need a better control of computers for their own research. 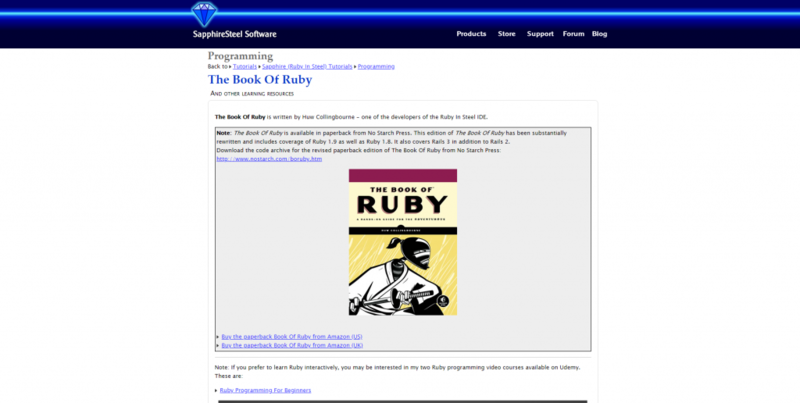 Note that The Book Of Ruby is an in-depth guide to Ruby. For a much simpler guide to the principal features of the Ruby language, there is also the free eBook, The Little Book Of Ruby, by the same author. 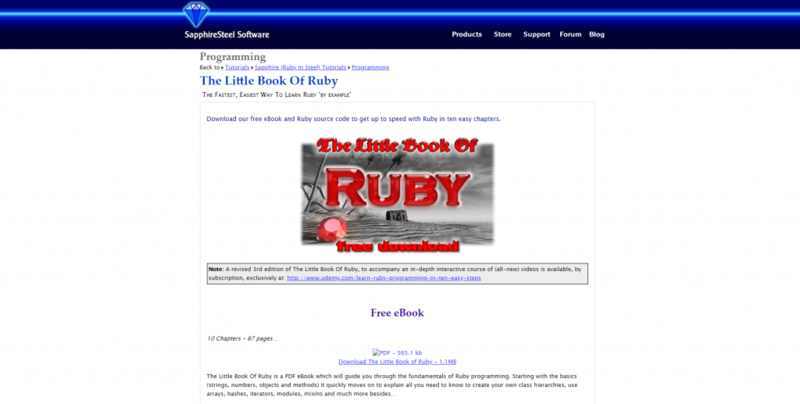 The Little Book Of Ruby is a PDF eBook which will guide you through the fundamentals of Ruby programming. Starting with the basics (strings, numbers, objects and methods) it quickly moves on to explain all you need to know to create your own class hierarchies, use arrays, hashes, iterators, modules, mixins and much more besides.